Any size of project undertaken from simple interfacing to integrate a third party piece of equipment into an existing bespoke concrete machine to the full electrical design & programming of a full project from the simplest single station machine through to the fully automated concrete machine production facility including transfer cars & curing chambers. Customers PLC program completely re-written using “State Transition Diagram” methods to allow for the SCADA system to reflect the exact sequence of operation. This allowed the operators to more effectively “fault diagnose” the system thus greatly reducing any downtime on the plant. 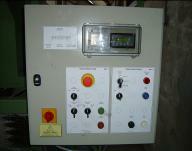 The SCADA system also permitted the operators to put the plant in any start condition to allow for a rapid restart. Customer had purchased a CMS-Multibloc M7 machine (from circa 1989) that had been “in a field” in parts for a couple of years. The machine was re-wired, re-programmed & interfaced with a later model CMS screw doser (from circa 2000) instead of the original rotacast with limited original information (all of the cables had simply been cut-off!) The customer provided all mechanical engineering with SES advising on modifying the plant from a 36” chain pitch to 42” to suit their longer products. The concrete plant was also subsequently moved when the customer relocated & improvements made to the original circuits to allow for automatic stack offloading. 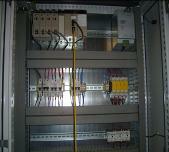 Oiler circuits were also upgraded to reflect advances made in the circuitry since 1989. 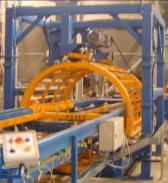 · Mould cleaning systems (turnovers, rotators, air knife). 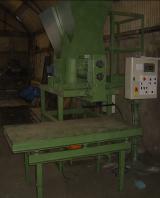 Based upon a CMS 36 design as the customer had had previous experience with three of this type of machine. The controls were brought fully up to date with addition of a “recipe” control system for a kit of carriers to allow the “ball placer” to place balls differently on individual products as they passed this particular station based upon the stack that was loaded at the in-feed position of the machine. 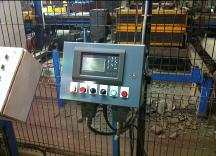 Complete electrical design, programming installation & commissioning project for a new concrete machine from CTI Wetcast. 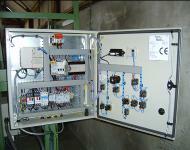 Electrical redesign, PLC & sensor hardware upgrade & refurbishment of electrical & pneumatic control panels. 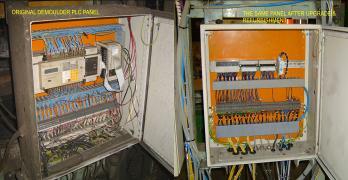 Before & after images of the demoulder control panel & pneumatic panel shown to right. All of the machines panels saw a similar improvement. 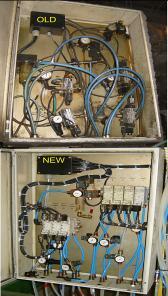 Customer had purchased a newer CMS2000 system that SES also installed & commissioned (see below); the requirement was to bring their older CMS36 (from circa 1990) machine’s PLC up to the same model as the fitted C20 / C60K’s had been obsolete since 1999; this reduced their spares inventory & potential machinery downtime should a PLC component fail. The original PLC design had been based upon multiple OMRON C20 & C60K PLC’s with hard wired interlocking, the new system would be an OMRON CS1 with remote input / output modules communicating with Compobus /S networking reducing wiring significantly. Additionally all of the machines power & control panels were refurbished; pneumatic panels were also tackled as a number of the original valves were starting to cause issues with the plant. 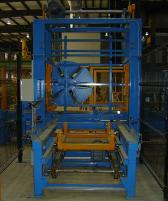 Modifications to the plant included the facility for a larger carrier size to allow for “block” products to be produced on the machine by addition of a few sensors at the lowerator. 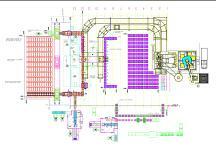 Full electrical circuit diagrams for the changeover were produced. 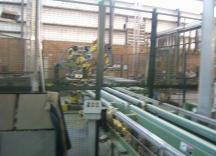 Customer had a requirement to improve the mould-release system on their plant. Originally supplied was a water-sprayer to activate their colouring system for the face of the products—after a change to the colouring system, the requirement was to improve the peeling demould system to increase efficiency of the plant. 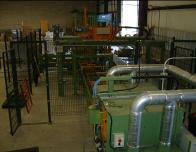 The spraying systems autojet unit was interfaced in liaison with spraying systems into the existing plant with minimal programming & wiring changes. Integration of a sophisticated Spraying Systems autojet control unit into an existing water-sprayer system to change over to a mould release agent. 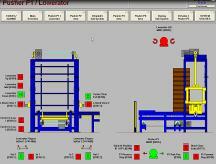 New twin screw doser (volumetric) electrical & program design. 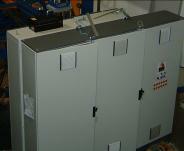 Also installed & commissioned the unit at multiple sites. Program contained a “randomization” function to allow either of the screws to start first randomly for a short random amount of time; this had the effect of “randomizing” to some extent the mix of two-coloured concrete that appeared on the face of the final product. Customer required upgrading the two PLC programs & HMI displays to increase the number of product recipes available from 99 to 999 on the specialized fill & strip lines. As the recipe was stored locally in the PLC DM area the PLC had to be upgraded to the next in the range, HMI screens were re-written to display the additional digit for the recipe number. This allowed the customer to increase its range of “kit” style products & colours; the machine had originally been designed to produce complete circle “kits” sequentially within the same stack of carriers so that the same concrete & colour was produced. As can be seen from the image on the left this was a large bespoke automated factory with 3 CMS machines integrated with 3rd party robots, batching plant & handling systems (previously partially commissioned by myself a number of years earlier with CMS). Complete Electrical, Program design, installation & commissioning project for a new concrete machine from CTMS Ltd.
Large carrier plant for production of “veneer” stone products incorporating a number of new design features. The machine was capable of dual carrier heights for producing both flat “veneer” stone & corner shaped “veneer” stone; it also had a bespoke demoulding system based upon inflating the moulds & a rotating mould cleaning system (see right). 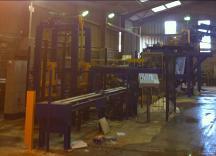 Medium sized carrier plant for production of “veneer” stone products incorporating a new design mould turnover demoulder. 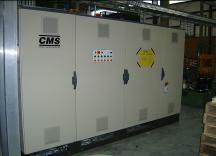 Installation & commissioning of a couple of CMS2000 plants in north eastern USA. 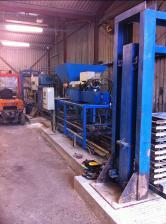 Medium sized carrier plant for production of wetcast paving slabs. 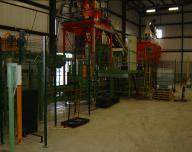 Both plants almost identical except that one plant was integrated with a Masa GmbH palletizing system. 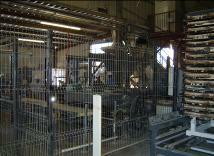 As both of these plants were commissioned after the voluntary liquidation of CMS Ltd. It was necessary to “reverse” engineer the PLC programs utilizing the electrical schematics that had been originally been sent out with the machines. Full operating manuals were also updated to include all changes not shown in the original documentation. Medium sized carrier U shaped CMS2000 systems joined with a Masa Henke transfer & finger car system feeding both lines with common curing chamber area. 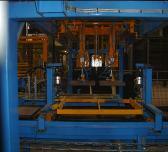 Fanuc robotics were utilized for palletization & pallet handling & were interfaced with both of the CMS2000 systems.